The government is formulating a National Policy for Advanced Manufacturing as one of the key tools to attain its objective of increasing the contribution of manufacturing output to 25% of GDP by 2025 from the current 16%. The National Policy for Advanced Manufacturing also aims to significantly enhance India's global manufacturing competitiveness. However, the government is mindful of the "threat to jobs" due to adoption of smart manufacturing. "There are a lot of concerns, lot of opportunities, there are also threats particularly on jobs so how to make our policies, how to tailor our industry, how to get ready for this in a manner that the transition is seamless and our people are skilled enough, may be to relocate to other areas," said DIPP Secretary Ramesh Abhishek. He was addressing a meeting to seek stakeholders' inputs on the policy. The meeting, chaired by Department of Heavy Industry Secretary Girish Shankar, also discussed the framework for introduction of 'Industry 4.0'. "The National Policy for Advanced Manufacturing which essentially is how to increase technological depth so that we become globally competitive and are not left behind," Shankar said. However, he pointed out that framing of the policy may take some more time because it needs a lot of consultation, and invited comments from the public. The capital goods policy envisages formulation of a National Policy for Advanced manufacturing which would include advanced materials, modern manufacturing like advanced robotics and 3D printing, among others. 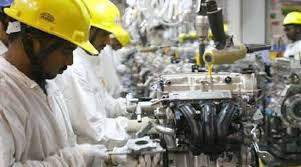 The National Capital Goods Policy, approved by the government in May, envisages increasing production of capital goods from Rs 2,30,000 crore in 2014-15 to Rs 7,50,000 crore in 2025 and raising direct and indirect employment from the current 8.4 million to 30 million.